It's still Christmas, so it's a good time to sing some favourite Christmas carols. *TiS474 / AoV1-012 / ATAR595 / CH623 / SFFS 2236 / HPP553 / A&M363 / GtG401 / G(II)539 / GC839 / GC(II)743 / G(3)848 / CP465 / W&R649 / Cha284 / SP175 / URW054 / Lau475 Here in this place new light is streaming / Gather us in (Haugen). Excellent words, very well known. “Nourish us well and teach us to fashion lives that are holy and hearts that are true”. Lyrics and sound sample. 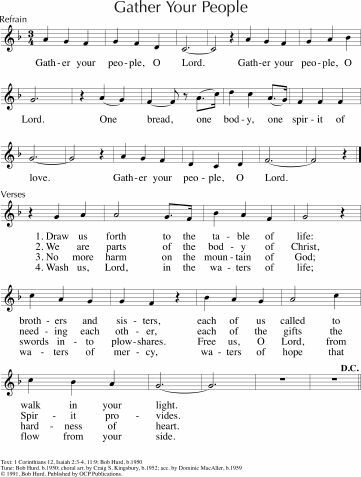 *MV007 Gather us in ground us in you (Hann) A simple chant which would be great for an invitation to worship. *TiS 647 / AoV2-012 / ATN 25 Comfort comfort all my people (Mann) This is one of my all time favourite songs. Easy to sing, beautiful lyrics. Chorus is“Comfort, comfort all my people, with the comfort of my word. Speak ye tender to my people, all your sins are taken away”. Lyrics and mp3. *TiS 670 / AoVK-138 / ATE 258 / CH692 Jesus put this song into our hearts (Kendrick) A fun Yiddish tune that gets even more fun if you get faster and faster as you go. Try teaching your congregation a simple side to side “dance” step. If you teach them and make it clear that it’s okay, you’ll be surprised how many people dance to God. Good for kids. *MV221 I am walking a path of peace (Tissandier) A simple song for the end of the service; words can be altered to paths of love, grace, hope, joy etc. *ATE 216 / Iona (SBL) / CH126 / StJ / ELW555 / PH472 / G(II)365 / GC527 / RS 671 O sing to the Lord / Cantai ao Senhor / Cantad al Señor (Traditional Brazilian) A good, fun and simple song that is easy to learn in Portuguese or Spanish too. Good for a call to worship. Good for kids. *TiS 706 / Taize / AoV2-142 / SFFS 2013 / GC(II)576 / G(3)620 / CP360 / SP194 / Srce79 / URW377 / Lau813 Bless the Lord my soul (Berthier) A beautiful and very well known Taize chant. Sound samples, sheet music. Good for kids. *AoVK-24 / Iona (T1AU) / CH756 / GC141 / GC(II)77 Bless the Lord / My sisters (Kenyan) Simple and fun Kenyan call and response. "Bless the Lord there is no other God" Kids would really enjoy this, and with some African drumming, it would really be excellent. Good for kids. 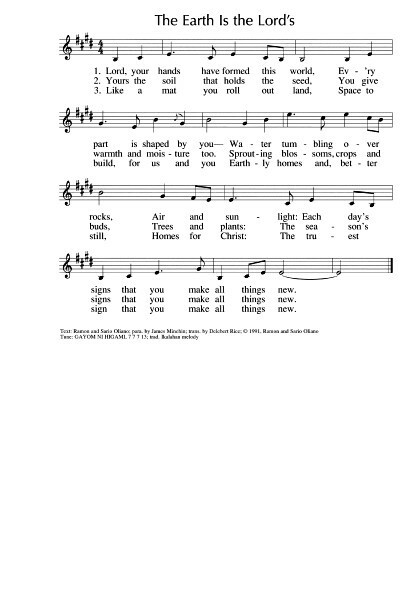 Iona (SBL) / CH140 / MV181 / WoV727 / ELW554 / G(II)341 / GC495 Lord Your Hands Have Formed This World / The Earth is the Lord's (Oliano) Good words of creation to a lovely, and not too difficult, Philippino melody. This would be a nice song for a children's choir or for the offering. Lyrics and sample sheet music. VU888 / LBW558 / ELW731 / PH458 / RS681 / CP358 / W&R642 / 82Hml-412 Earth and All Stars (Dexter) Fun words of cosmic praise. 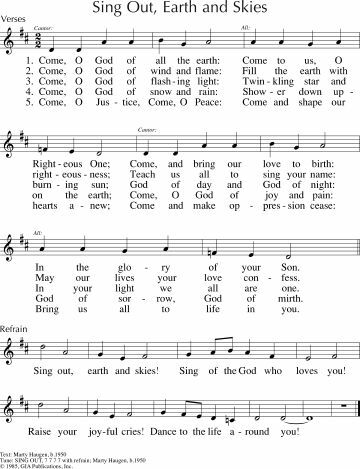 An easy hymn-like tune. 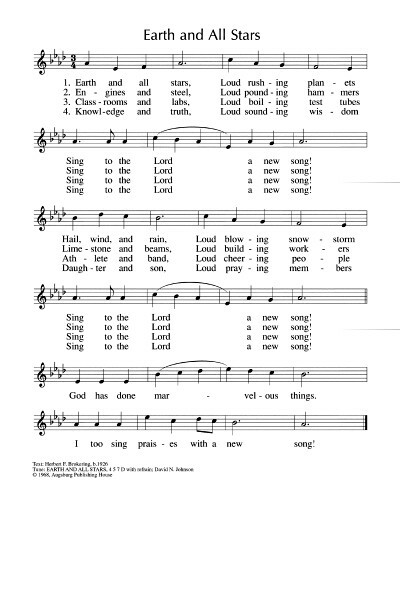 I really like the "loud boiling test tubes" bit, although this verse is not in all hymnals. Sheet music and lyrics. Keyboard sound sample. *TiS 417 / AoV2-133 / ATW 448 / VU387 / StJ / WoV683 / ELW397 / AA94 / HPP237 / HPPS323 / CP657 / W&R135 / Cha244 / URW203 / StB220 Loving Spirit, Loving Spirit (Murray). There are about a zillion tunes set for this. I prefer FELICITY (by Colin Gibson TiS 417), but also like RESTORATION and OMNI DIE. Lyrics are here. *TiS 163 / AHB 112 / NCH556 / UMH150 / LBW463 / ELW771 / HPPS268 / W&R644 / Cha651 / URW084 / 82Hml-580 God who stretched the spangled heavens (Cameron) Good words of creation of nature and cities and creative possibilities for the future. Some sources do not have inclusive language. There are many possible tunes. I like it best to HOLY MANNA as in the link. Lyrics and sound sample. NCH072 / UMH552 / VU362 / ELW530 / PH465 / CP534 / W&R597 / Cha278 Here O Lord Your Servants Gather / Sekai no Tomo (Yamaguchi) Beautiful song about being a community of faith seeking strength and courage. Lovely simple Japanese tune. Sound sample and lyrics. Again, Christmas carols (new or old) and Epiphany songs would fit well for this. *NCH164 / VU79 / StS030 / WoV652 / LBW652 / ELW314 / PH411 / GtG744 / W&R231 / URW138 Arise your light is come! (Duck) Good general words of Christ coming to bring justice to the familiar tune ST. THOMAS (TiS 271). *TiS 156 / AHB 91 / AoV1-135 / ATA 123 / CH212 / UMH145 / VU409 / ELW556 / GA537 / A&M545 / HPP267 / PH469 / G(II)546 / GC756 / GC(II)748 / G(3)855 / CP003 / W&R35 / Cha053 / URW186 / 82Hml-008 / Lau671 Morning has broken (Farjeon) This song makes me smile every time. Here's Yusuf Islam (when he was Cat Stevens) in 1976 (love those green boots). *Iona (M&G) / CH359 / MV033 / GtG137 / ZSS54 / StJ / ELW253 / GA293 / SFFS 2085 / G(II)276 / GC370 / GC(II)364 / G(3)429 / CP368 / W&R402 He came down that we may have love/ Jesus came bringing us hope (Traditional Cameroon) A lovely simple song - you can make up words and have a lot of fun with this if you also use some drums. Good for kids. *TiS 666 / AoV2-113 / AoVK-126 / ATOK 409 / NCH526 / Iona (Common Ground, Freedom is Coming) / CH516 / VU646/647 / WoV650 / ELW866 / A&M483 / SFFS 2235 / HPP153 / G(II)357 / GC513 / GC(II)516 / G(3)594 / Cha442 / SP235 / Srce737 We are marching in the light of God / Siyahamba / Caminando (South African) A very popular chorus, with possible alternate verses, depending on your source. Sometimes people get anxious about the word "marching", but remember that this song comes from apartheid-era South Africa, where people were protesting so that they could vote in their own country. And the marching is toi-toing, much less militaristic than what Westerners imagine. *AoV2-060 / SFFS 2172 / HPP307 / G(II)518 / GC718 / GC(II)710 / G(3)807 Come live in the light / We Are Called (Haas) Joyful song of mission. I love this, and we've not sung it at BUC for ages! Lyrics, sheet music sample and slowish sound sample here. I would double the speed of this (almost). AoVK-123 / NCH3 / Iona (M&G) / UMH148 / VU308 / WoV794 / ELW837 / HPSS271 / G(II)338 / GC499 / G(3)911 / CP407 / W&R26 / Cha58 / URW232 / 82Hml-385 Many and Great O God are your works / Wakantanka Taku Nitawa (Lacquiparle) Good words. Simple tune. Sounds great accompanied by a good Native American-style drum beat, which is a great way to get people involved in music-making. Lyrics here. NCH401 / W&R388 O god in whom all life begins (Daw) Excellent words of living as a community of faith. Sung to a simple English melody.